What is bench rest shooting? Shooting a small-bore rifle whilst sitting at a bench/table. Sounds easy doesn’t it! There is a World Rim-fire and Air rifle Bench-rest Federation (WRABF) organisation and also a European Rim-fire and Air rifle bench-rest shooting federation. Both these organisations shoot at 25m, 50m 100yards and further distances. They have a set of rules which can be found on the internet here and here. There is also a home grown web site for United Kingdom Bench Rest Shooting dealing with large bore rifles at longer distances. 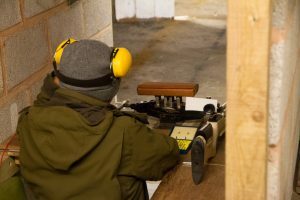 The National Small Bore Rifle Association (NSRA) also have organised bench rest competitions known as Short Range Bench Rest shooting at ranges more suited for small bore rifles using bullets (0.22 calibre) or air rifles using pellets (0.177 or 0.22 calibre). The short range distances are 20 yards, 25 yards and 25m. Here’s one of our members lining up for his 20 yard target in lane 2. 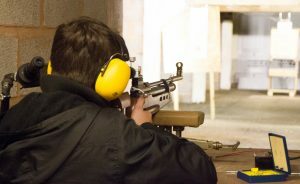 The Minehead range is not licenced for any other form but target shooting from the prone position, this means we can’t shoot Short Range Bench Rest with a bullet rifle. 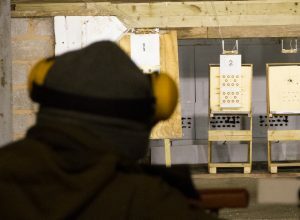 However, the range can be configured for using air rifles and with pellet catchers installed at 20 yards; air rifles of either 0.177 or 0.22 calibre may be used. The target makeup lends itself to flat headed pellets producing the best clean hole which is better to score. The club will offer the use of air rifles until such time as you obtain your own. The bench is part of the range setup and the rest consists of a modified car scissor jack which is placed on the bench. If you have your own rifle you may bring it with you and have a go. No special clothing is needed to start, rules govern what specialist clothing you can wear. Yes there are rules which you will be explained to you as you start to shoot. The rules on the rifles used are varied but the rifle(air) can be of any small bore calibre (less than 0.23) and have any type of sights. Telescopes are allowed. Scoring the targets is done by a qualified person, but tips are given to aid making your own estimated target score. In this image you can see a junior club member shooting 20 yard Bench Rest. Note the (tele)scope to his left (for checking the shot holes) and his box of pellets to his right – in easy reach! We enter the Somerset County competitions and in the winter seasons the County enter teams in the NSRA inter-County competitions. You can find the latest results for Bench Rest competitions here.